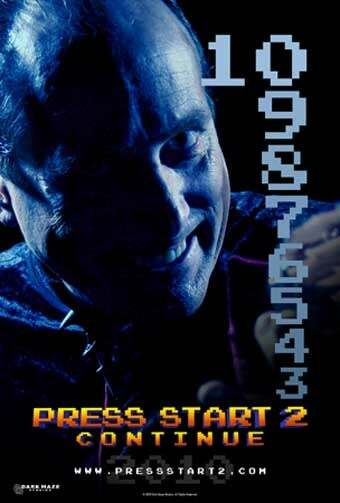 The unapologetically cheesy video game homage film Press Start gets the inevitable sequel next year, as Dark Maze Studios announces the brilliantly named Press Start 2 Continue. I was a big fan of the original Press Start, a direct-to-DVD affair that had a shoestring budget, ridiculous characters, and a great deal of heart. It was essentially a group of fans lampooning classic video game conventions, riffing on turn-based RPG's ("Why'd you let him hit you?" "It was his turn! "), random switch mechanisms (the main character has to push his bookcase over a switch to open his bathroom door,) and just about everything else. Producer/director Ed Glaser explains, "The great thing about making these movies is that everyone involved loves the games we're spoofing. From the actors to the set designer to the composer, we all live this stuff on and off camera." The new film reunites the heroes Zack, Sam, and Lin-Ku, and if that teaser poster is any indication, Count Nefarious Vile might be back to exact his revenge on the world that spurned him, or something. You can follow the production of the second film at the Dark Maze Productions blog. Looking forward to seeing what they come up with next. Can they top the original? Most likely!